I told you I would keep you updated on my brand building project, so here it goes. 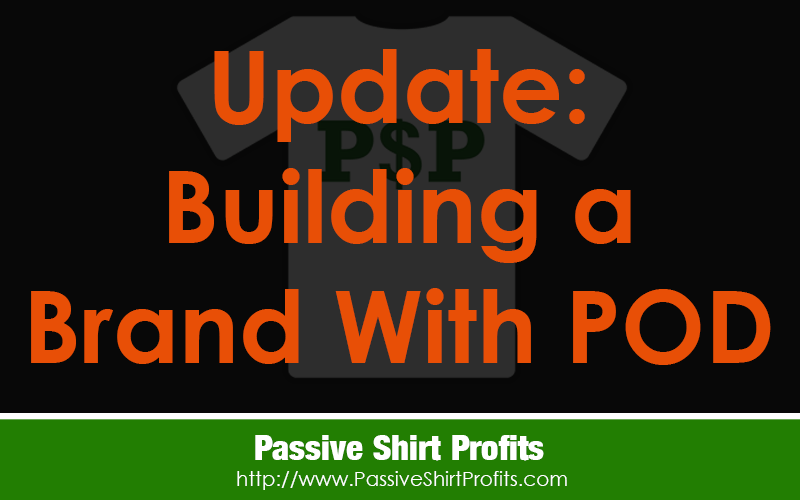 When I first started with POD, it was all about making passive income from sites like Zazzle, Spreadshirt and later Merch By Amazon. However, I knew there would come a time when competition would get so thick that it was no longer smart to ONLY focus on organic traffic if I wanted long-term success. That time is NOW, in my opinion. In fact, I started building my brand last year as the competition began to stiffen up on Merch By Amazon. I was extremely intimidated by this process because I knew that meant possibly building a website, a social media presence and all that stuff that goes with brand building. POD can really spoil you because there is nothing to do but upload designs. However, you have ZERO control over your destiny. Because you are reliant on an unreliable traffic source that will likely decrease with competition. I see so many people doing waaaaaay too much with new business ventures. They spend thousands of dollars on a fancy shop, logo, business cards, high-end designer etc. yet they have no idea how to drive traffic or know if their niche is even in demand! People think building the shop is the hardest part, and once that’s done, the sales will just start rolling in. Don’t get me wrong. You SHOULD invest in your business, but what’s great about POD is there’s a lot of ways to do FREE research and test the market before you invest. I have spent VERY little on this. My biggest investment has been time. If you are just starting out, you have to understand the market and discover what is selling. You also need to learn how to draw traffic to your designs. That’s just as important, if not more, than building the shop. Heck, you can build a shop in minutes with all these POD sites, and even places like Shopify make it super easy to setup. It reminds me of my niche website days where people would first spend thousands of dollars on a fancy website, and have no idea about SEO, the niche, competition, their angle, etc. Then they’d wonder why no one is visiting or buying anything. I cannot emphasize how important it is to do the research and understand the market! The nice thing about POD is you can test the waters for free by trying different design ideas on various PODs. It will only cost you time and experimentation. Once you find a niche you want to stick with, then you can slowly began building your brand. There really is no clear-cut method to finding the niche, and I think this is where people get stuck. You might have to try a ton of keywords and ideas before you find something, but it’s worth it. In June 2018, I launched a niche business Pinterest account to promote products from my POD shop. I had been selling shirts on this keyword I discovered on MBA in 2017, and decided to go with this niche due to lack of competition at the time. The traffic and exposure on Pinterest came almost instantly. I’ve been documenting this on various YouTube videos like this one and that one. As of today, my account is getting 700,000 views per month, and it’s not even a year old. I also don’t have very many followers. 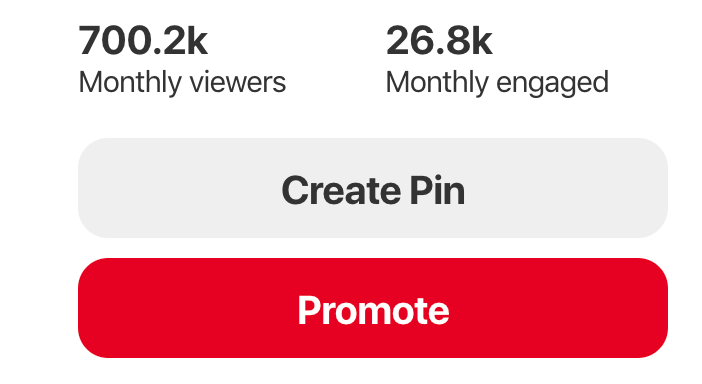 Followers are overrated on Pinterest. It’s about clicks and re-pins. So that 26,000 number above is my total clicks and re-pins in the last 30 days. I will definitely be coming out with a Pinterest course this year, so stay tuned for that! About 7 months later, I setup an Instagram account (sigh). I wasn’t looking forward to this because I have a tendency to abandon social media accounts I create due to lack of success and interest. I followed a few people, posted a few pics and after a few weeks, I eventually abandoned my account. You might remember me talking about this on YouTube. Then about a month later, I logged in to my account and noticed I had more followers and some likes on various images. That encouraged me a bit, so I put up some of my most liked images from Pinterest (about 50 in total). After a few days, I received even more followers and likes. Pinterest makes a GREAT research tool. It gives you great insight into what images are hot and well-liked. This is how I often decide which products to upload to multiple platforms. Now, I’ve been using my Pinterest account to determine which images to feature on Instagram. I only have 20 followers on Instagram, yet the engagement I’m starting to receive is showing me I just need to keep going. Right now I’m following 14 people, and I’m not doing that follow for follow crap. I definitely learned from Pinterest that it’s not about amassing a bunch of random followers or even following a ton of people to get results. It’s about the quality of what you post. Everything else will just fall into place with time. I’d much rather have quality art with a targeted following, than thousands of random followers with different or unknown interests. People seem to love my art. I just need more volume and upload consistency. I cannot emphasize how important it is to have original, unique designs that really connect to the audience you’re targeting. It also helps when you know the niche well. I have to admit, this is not a niche I knew much about at the time. But I began to research and study it as time goes on. My brand has been generating personal design requests since last year. Not only am I earning passive income from my shop, but I’m now fielding some freelance requests. I’ve even had requests for bulk orders and digital files for local printing. It’s kind of crazy to me that I went from teaching about affiliate marketing a few years ago to now taking freelance design requests! The freelancing part has been a bit of challenge with pricing and managing the various requests (more on that later.) Roberto Blake gives great advice in that area everyone should listen to. I’m still learning, however, it’s been nice to have another income stream when I have time to field those requests. It also validates that I’ve picked a good niche and that people really like the art. Everything I’m doing is under one brand name instead of my own name. I think it’s important to keep everything consistent and use the same brand name on all platforms. Slowly but surely things are taking shape, but I’ve got a long way to go. I just wanted to reach out to remind you that things are likely going to start slow, but don’t give up. You are probably not going to see results right away. I sure didn’t. Just know your audience and put originality FIRST. That will take you far. Even though Merch is still my top earner, I’m glad I’m not getting complacent. As competition increases, I am definitely focusing less on MBA and more on my brand. My future courses will also be more brand focused. I want to target small or up-and-coming businesspeople/individuals who are in this for the long-haul, and not just some organic POD traffic. That’s going to alienate a lot of people, especially ones who were drawn to this site because of Merch By Amazon. But it will also attract more people who are serious about long-term success. We can learn and grow together. I told you from day one that this meant more to me than Merch By Amazon. I’ve always focused on the bigger picture. Yes, this is a lot more challenging and takes longer than getting some organic sales on Amazon. MBA came easy to me, but building a brand has been a lot more challenging. You may feel the same way, but if you stick it out and aspire to have the BEST designs in your niche, you will have rewards in the long run. Meanwhile most PODers will never strive for more than organic sales across the various platforms. There’s nothing wrong with that if that’s your personal goal, but success will be limited while you constantly hop to the next hot keyword until it reaches saturation. If you want to get off the emotional roller coaster of up and down organic sales, consider picking one niche and building a brand. Start small. You don’t have to do everything at once. Pick a niche you are either passionate about or one that you are selling a lot of designs in. It really helps if you know the niche because it will inspire creativity. I wouldn’t start this brand building process until you have a niche you are already selling in or at least know a lot about. You also need to check and make sure people are buying products in this space. Remember it’s not about what YOU like. Let the market dictate what you sell. Use these free POD platforms for research to see what sticks. Choose a place to host your shop. If you don’t want to invest in much right away, go with a free shop like RedBubble, Spreadshirt, etc. Once you start making a steady income, you might want to upgrade to something self-hosted or a site with better options like Shopify. You’ll have more control over what you can do with your shop. Remember, the ultimate goal is to funnel traffic to either a website or shop that YOU control and own. The whole point is to have an audience you can reach OUTSIDE of POD. Start with ONE social platform for marketing. I began with Pinterest and once that was bringing in traffic on autopilot, I started building up Instagram. You don’t have to do everything at once. Remember, your designs need to resonate with people and stand out. If you’re just copying or making renditions of people’s existing designs, that’s not a good place to start. You’re playing the lazy game, and that’s a short-term strategy. This is definitely a race, not a sprint. And I’m in it for the long haul. Just remember to start small. Like the old saying goes…. Excellent blog! I’m now going to use your ideas in this blog as a guide. Also, to let you know, I’ve been receiving your emails, & I read them constantly. I’m also subscribed to YouTube channel, by the way. This blog is definitely a game changer for me. It’s funny you mentioned Roberto Blake, he has great videos, on his YouTube channel. But I learned, that the POD business has quite a bit of competition. Thanks Lisa Irby, & keep those emails, & videos coming. This is good stuff. Aside from the content and advice, long-time followers are getting an up-close peek at your progress. This is some next-level stuff, as the kids say. Thanks Lisa. I can’t wait to get back to my website. I recently moved and it has taken up so much of my time. And my family doesn’t understand (or doesn’t believe) what I want to do on the internet. My website and content development has taken far too long. But this weekend I should be able to get back to it. You motivated me to go in T-Shirt business, i hope to finish the whole process in the next months. We would like more news from you.